Agitator bead mills are used for grinding and dispersing a wide variety of products, such as paints and lacquers, functional coatings, ceramics, plant protection products, foods, cosmetics and pharmaceuticals. These products have diverse characteristics, such as rheological properties, temperature limits, particle size and particle size distribution for example. Therefore, the optimal processing of these products requires different methods of operation, specific energies and energy densities in the agitator bead mill, which can be realised using different versions of the machine with disks or pegged agitators. Depending on the product group and product properties, different types of agitator bead mills of different sizes and drive performance are used, so until now the use of a universal agitator bead mill has not been practical. NETZSCH-Feinmahltechnik GmbH has now developed the new ALPHA modular machine platform. Compared with earlier-generation machines, this series is designed such that different grinding systems can be mounted on the same base platform as appropriate for a defined drive capacity. 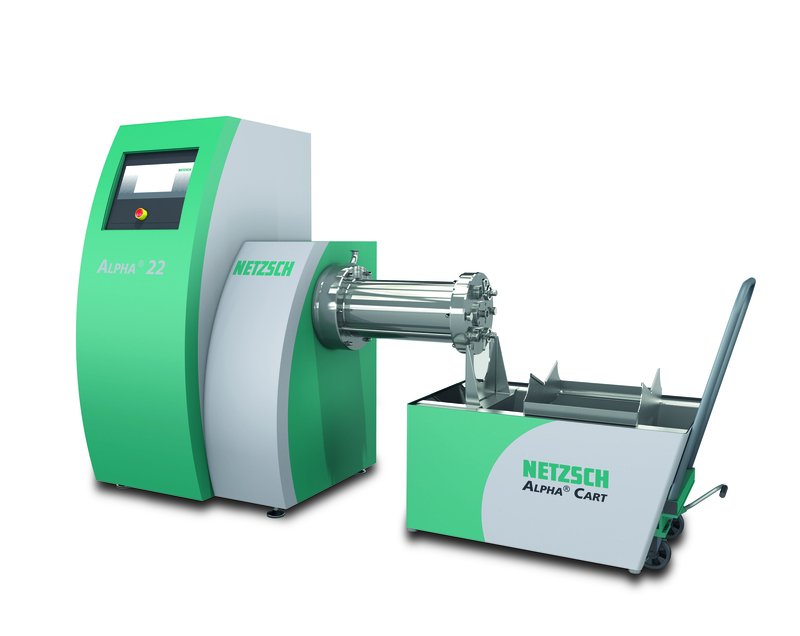 The advanced DISCUS disk grinding system is used here primarily for dispersion applications in multi-pass operation. The ZETA system with optimised grinding media separation is used mainly for operation in the circulation or multi-passage mode. As the third grinding system, the new MACRO peg system facilitates the highest power input in passage operation. The ergonomic design of the machine stand was a primary consideration during the development phase. The ALPHA has a self-supporting grinding chamber, which ensures good accessibility to the grinding area during operation and maintenance. The clear, straightforward design with integrated hoses and pipes results in easy operation and prevents contamination. At the same time, this means that considerably less effort is required for cleaning.